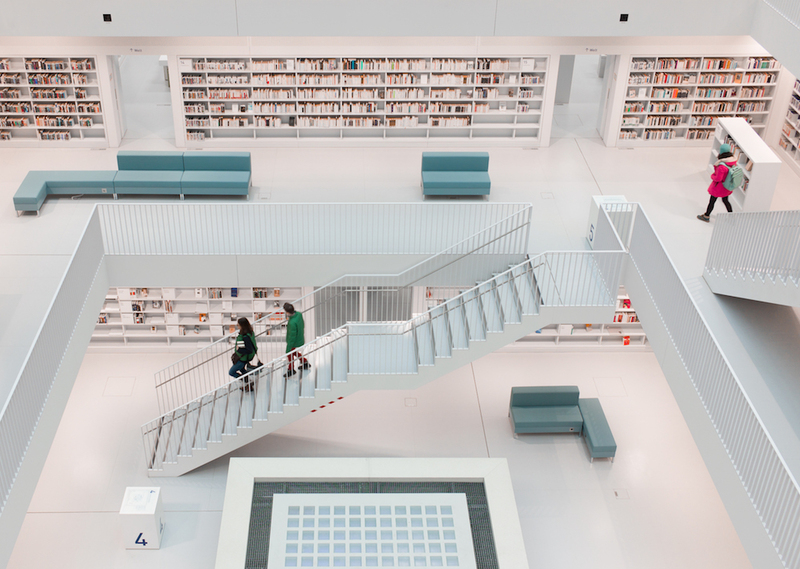 The Stuttgart City Library in Germany is a location which is frequently visited by photographers. The building was designed by the German-based Korean architect Eun Young Yi. 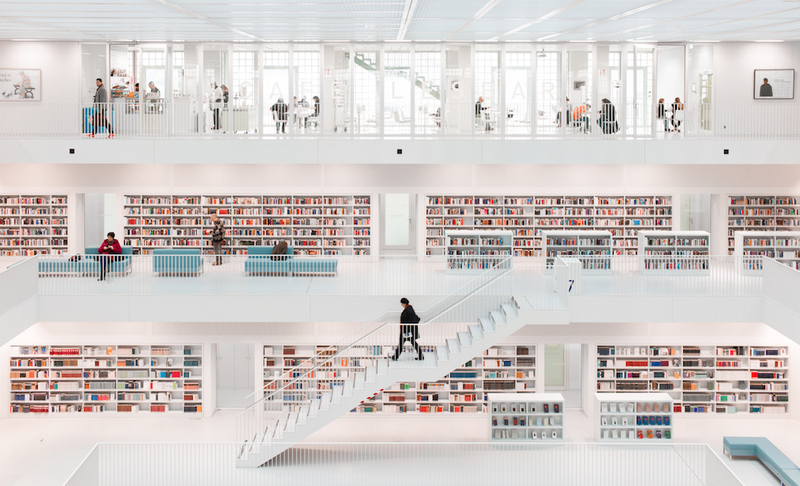 The opening ceremony of the library took place on October 21, 2011, and since then countless photographs have already been taken of both the exterior and the interior. I visited the library in September 2013 for the first time and was deeply impressed by the atmosphere inside the library. The visitor faces completely new visual impressions when compared to other famous older libraries. 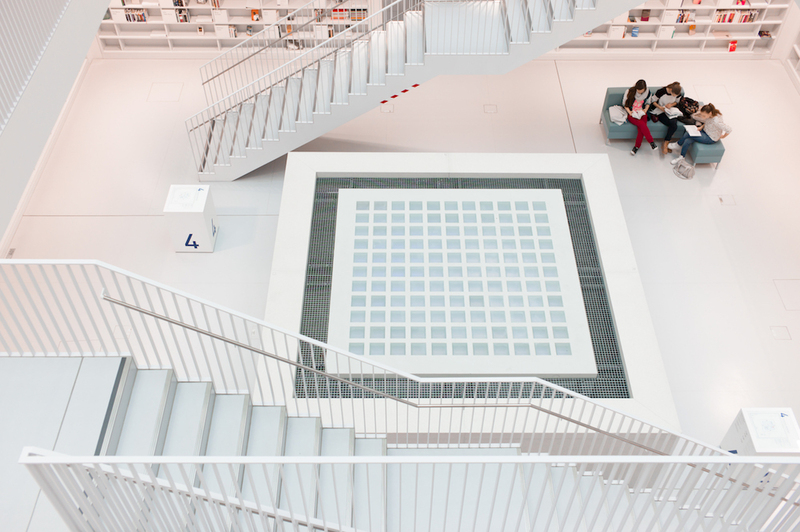 The Stuttgart City Library was established as the new intellectual and cultural center in the state capital of Baden-Württemberg. 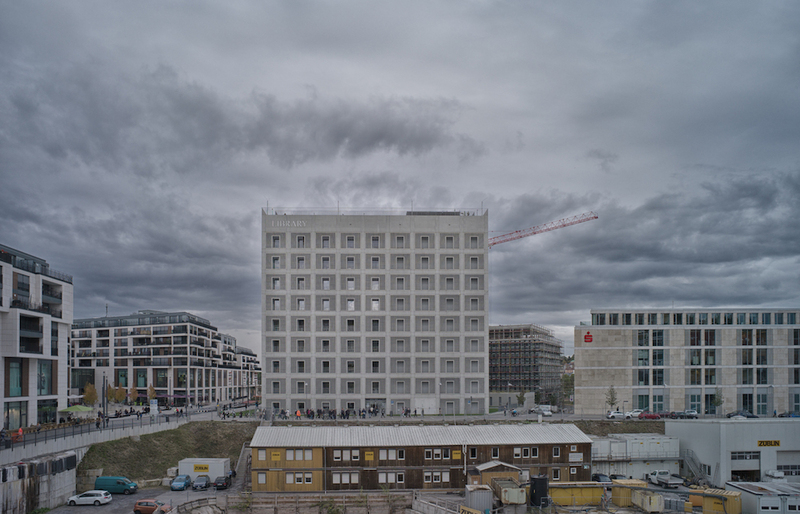 The building is designed as a cuboid with a square base area measuring 44 meters in side length and 40 meters in height. The shell of the building is designed as a double façade consisting of a glass brick layer and an inner façade which acts as a thermal shell for the building. The area between the façades can be used as a promenade, and will be lit up at night with blue lighting. The building can be accessed from all four sides of the cuboid. In the circular foyer there are book-/media-return machines, part of the book sorting equipment which can be seen operating behind glass walls. In addition, there are information boards, video installations, and areas where waiting visitors can read newspapers. 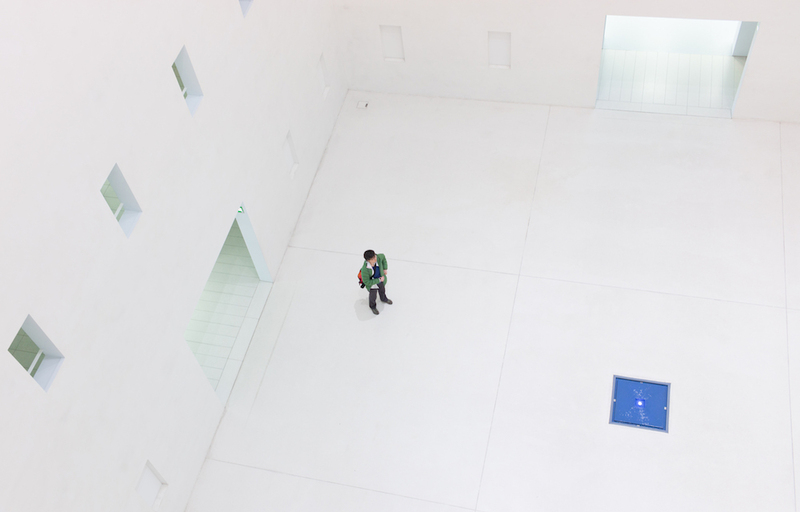 In the center of the building lies its spatial and meditative heart: this is an archaic space type which, like the Pantheon, makes some reference to the cavern as an original place of human habitation. Cuboid-shaped, with nearly nothing that distracts from its purpose-free character, it can be seen as a huge commitment to emptiness and complete purity. 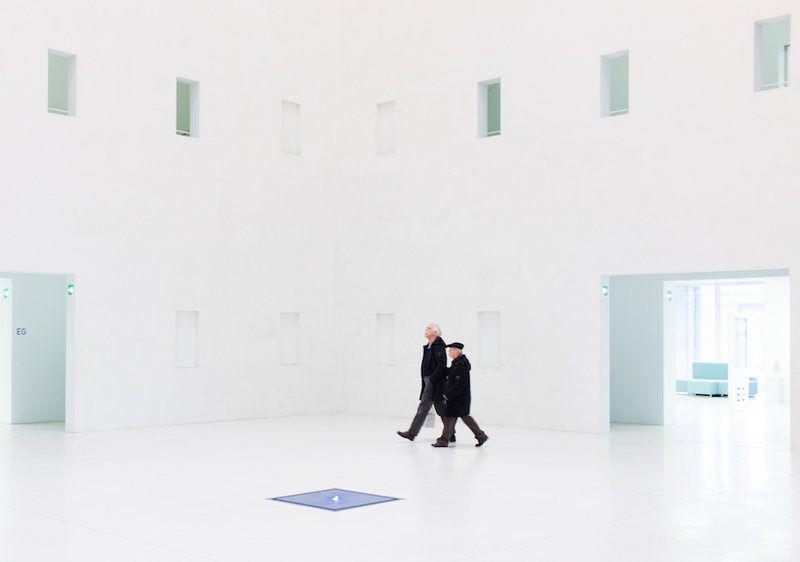 Solely, right in the center of the ground, a small blue colored 1 m2 measuring water feature, installed flush with the ground, under a glass cover, distracts from the deep impression of emptiness.This room is lit by natural light coming from the central opening (oculus) above and is surrounded by staircases from the ground floor up to the 3rd floor. The design of the reading rooms in the upper half of this heart, from the 4th to the 8th floor, takes its inspiration from Étienne-Louis Boullée’s grand design vision of the French National Library at the end of the 18th century. Staircases arranged in pairs create flowing walkways between the floors. 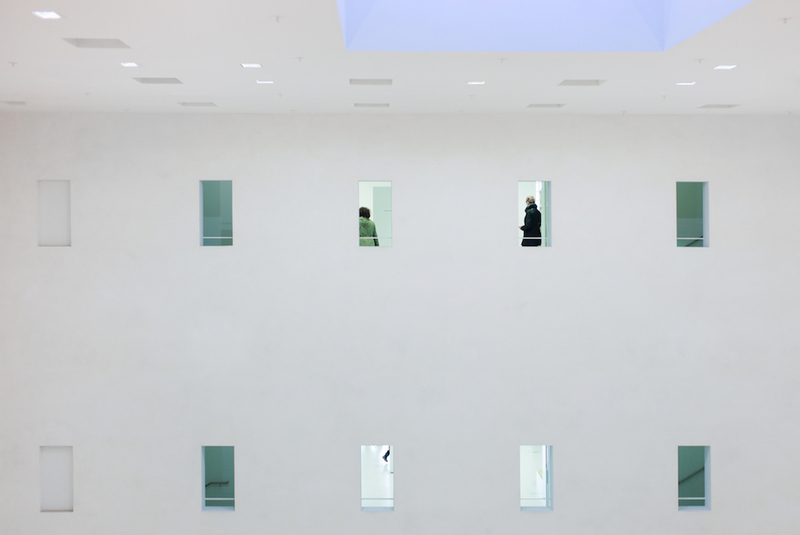 The stepped galleries extend the space in the shape of a funnel right up to the glass roof. 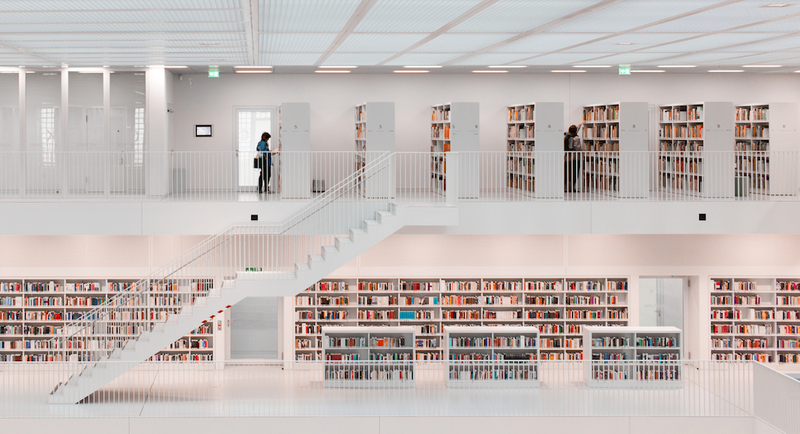 All the interior furnishing like the bookshelves are colored in an unobtrusive, gentle grey. Solely the book spines set bold color accents, thus emphasizing the book’s role as the main actor in this environment. The Forum is a function room with around 300 seats that can be divided into two rooms. This is the third variation of the square space format, and is designed flat and disc-shaped, and it is a dark blue pastel color throughout. 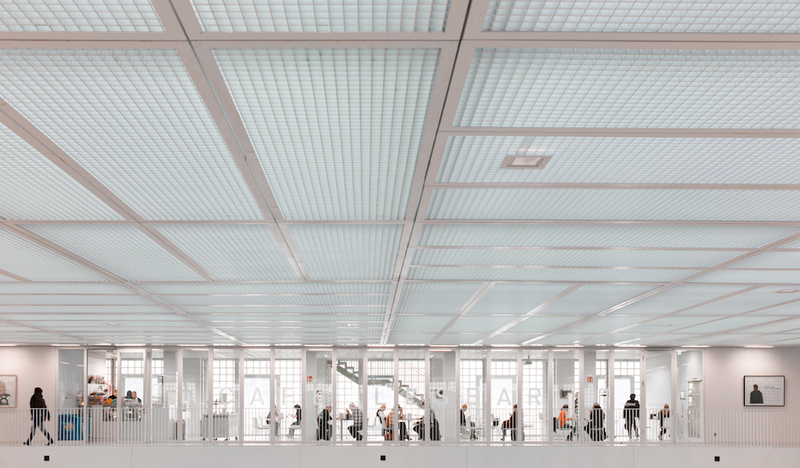 All the elements like shelving, groups of seats or individual work places can easily be arranged under the free-span mesh ceilings of the media presentation areas. Areas for seminars, or just spending time, such as the Caféteria on the 8th floor, the Graphothek, from where you can lend graphics by well-known artists, and several other meeting rooms are separated by no more than glass walls from the surrounding areas. The workplaces of the administrative areas are lit with natural and anti-glare lighting. Wide step- free corridors and doors ensure the safe transport of the book trolleys. The glass roof consists of four axisymmetric penthouse roofs. The supporting structure consists of 25 m long steel girders that intersect at the centre. At the top, there is solar protection with a photovoltaic system. 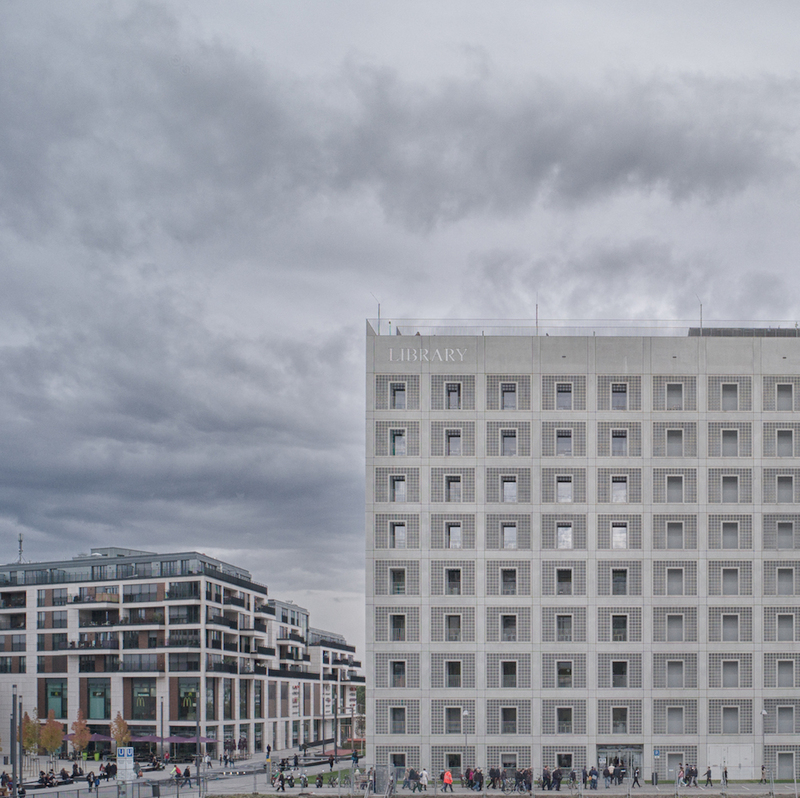 The roof terrace, the fifth façade, completes the cube-like appearance of the building. Like the other façades, it is lit up blue when it is dark. 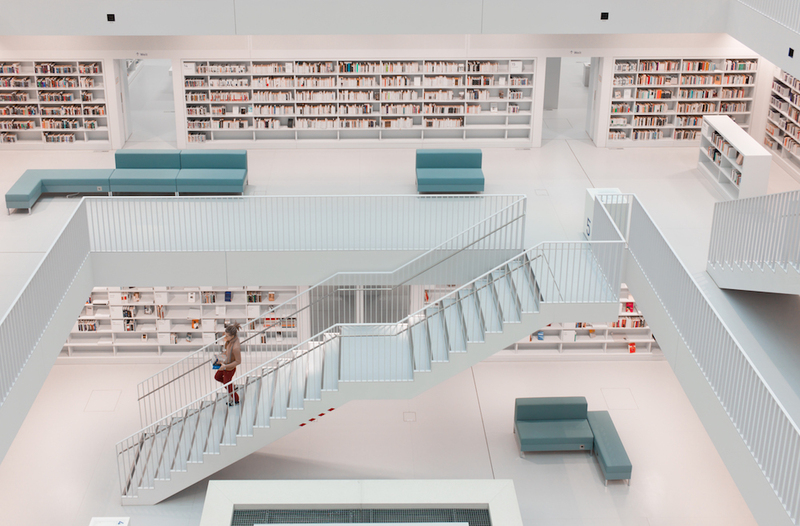 It is linked by lifts, stairs and ramps to the 8th floor, where the viewing platform offers panoramic views over Stuttgart and the environs. In summary it can be said that the architect Eun Young Yi convinces with a high atmospheric, even aesthetic quality, and an overall clearly-structured order. Despite of the introduction of new technologies related to our information society the main actor in this environment is the book. The printed book now exists since several centuries and its future is subject of fierce discussions. How long will the printed book continue to exist ? Born 1949 in Luedenscheid, Germany. Hans-Martin Doelz studied Mathematics and Business Administration at the Universities of Bochum and Goettingen and graduated in 1979 with a master’s degree in Business Administration.He began to create art after retiring from his job. Initially he took photographs and changed their appearance through heavy alienation into mainly abstract images. He also tried to create images without any camera, only by using computer algorithms like “processing”.